Great for the cheerleader in your family or for the entire pep squad, the blonde cheerleader in red uniform Christmas ornament personalized with names and the year is available in brunette and African American styles too. These sports ornaments personalized to make them memorable keepsakes feature a pretty display cord and arrive in our exclusive velvet gift and storage bag. 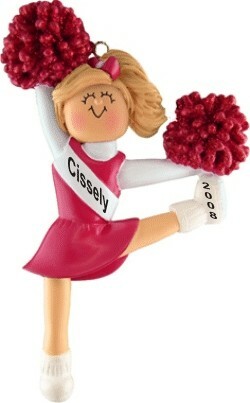 Build excitement in the coming season or celebrate a successful one with the cheerleader blonde w/ red uniform personalized Christmas ornament from Russell Rhodes.